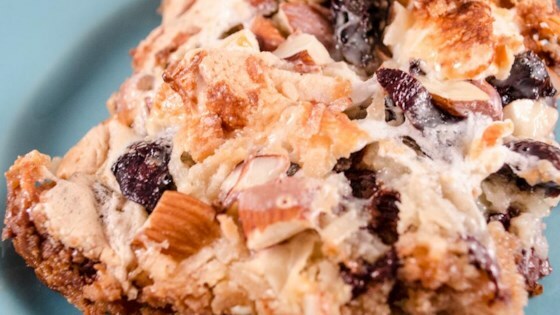 "A twist on the average magic bar, this rich and delicious cookie bar has a surprise tartness of Craisins®. We make every Christmas season and they're snatched up in no time!" Preheat oven to 350 degrees F (175 degrees C). Line a 9x13-inch baking pan with parchment paper. Mix graham cracker crumbs and butter together in a bowl; press into the prepared pan. Pour 2/3 the sweetened condensed over the graham cracker crust. Sprinkle chocolate chips, marshmallows, coconut, pecans, and cranberries over the sweetened condensed milk layer; press into the pan. Drizzle the remaining 1/3 sweetened condensed milk evenly over the toppings. Bake in the preheated oven until topping is golden brown, 25 to 30 minutes. Cool in the pan for at least 20 minutes before cutting into squares. Very good. A little messy and they fall apart fairly easily, but tasty. Very sweet and "gooey". Not enough crackers crumbs to fill bottom of pan.